حجم معاينة PNG لذلك الملف ذي الامتداد SVG: 600 × 600 بكسل. الأبعاد الأخرى: 240 × 240 بكسل | 480 × 480 بكسل | 768 × 768 بكسل | 1٬024 × 1٬024 بكسل | 720 × 720 بكسل. On a shield an open book beneath which is a lamp of knowledge emitting rays above in base two crossed quills. 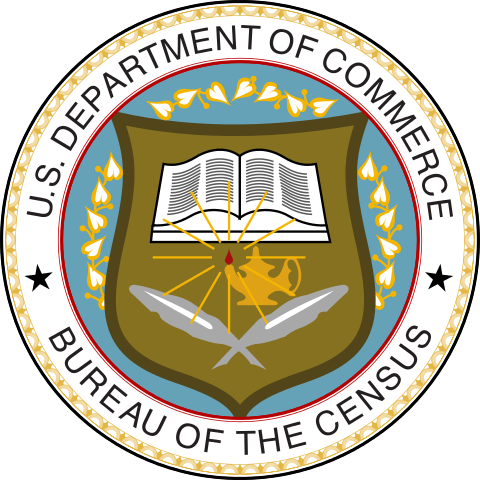 Around the whole a wreath of single leaves, surrounded by an outer band bearing between two stars the words "U.S. Department of Commerce" in the upper portion and "Bureau of the Census" in the lower portion, the lettering concentric with an inner beaded rim and an outer dentilated rim. 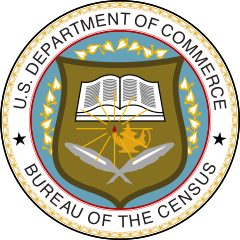 المصدر Own work based on: Census Bureau seal.jpg and several government documents. حالي 21:48، 24 فبراير 2008 720 × 720 (233 كيلوبايت) Clindberg Several fixes to outer rim -- fixed spelling mistake by using vector inscription from http://bhs.econ.census.gov/2002forms/nc99026.pdf, changed outer and inner rims to more match available bitmap versions, and fix some layering mistakes.